Air New Zealand plans to use biofuels to fly its jets for the first time. Rising crude oil prices have caused the airline industry to spend 40 percent of its budget on fuels. Air New Zealand plans to fly a weed-powered jet later this year in a trial to determine if the biofuel technology is worth further research. The airline pledged this week to use 10 percent, or one million barrels, of biofuels for its jets by 2013. If the trial this year is successful, the company could commit to a two-year research program to develop cheaper and more effective biofuel from jatropha, a plant with seeds that contain 30 to 40 percent oil. The rising crude oil cost has prompted airline companies to turn to cheaper alternatives. Fuel costs account for about 40 percent of the airline industry’s expenses, according to John Heimlich, vice president and chief economist at the Air Transport Association of America. Air New Zealand certainly isn’t the only one who is looking into jatropha. 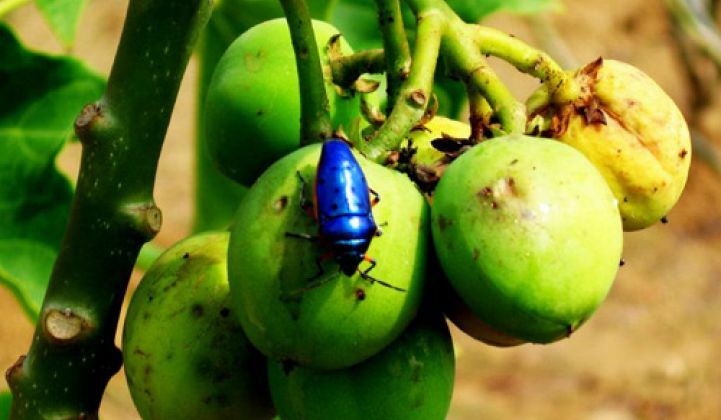 Among others, BP and Imperium Renewables are developing jatropha-based fuel. A team led by Daimler, Archer Daniels Midland and Bayer CropsScience is also working on a similar initiative. Fuels made from jatropha would cost about $43 a barrel, versus $122 a barrel for crude oil, according to Jatrophabiodiesel.org, a nonprofit for promoting rural India’s participating in the biofuel market. The Website, one of a number dedicated to the science and economic potential of making fuels out of jatropha, claims that jatropha-based fuel is cheaper than fuels made from soybean oil ($73 per barrel), rapeseed oil ($78 perbarrel) and palm oil ($46/barrel). Virgin Atlantic became the first airline to fly with biofuel when its Boeing 747-400 flew from London to Amsterdam in February. One of its four tanks contained fuel with 20 percent biofuel made of coconut and babbasu oil. Continental Airlines also plans to test biofuels next year. In fact, the strong interest from the airline industry has seeded startups gunning for this large market (see Continental Biofuel Demo Prepares for Takeoff). Air New Zealand, along with Boeing, has been working with scientists in Hawaii to commercialize jatropha-based biofuel.